Newly acquired Sounders left back Brad Smith could start Sunday against Western Conference leading FC Dallas as the Sounders look to extend their unbeaten streak to eight games. Smith's immigration paperwork arrived sooner than expected and coach Brian Schmetzer won't waste time getting him on the field. The Sounders are ready to throw everything they’ve got at a conference-leading opponent that looms as the season’s biggest test of where they stand and how far they’ve come. Newly acquired left back Brad Smith has had his immigration paperwork come through quicker than expected and will suit up against FC Dallas on Sunday at CenturyLink Field. Sounders coach Brian Schmetzer is leaning toward starting Smith, on loan from English Premier League club Bournemouth, in the game after pulling incumbent left back Nouhou at halftime last Saturday. Schmetzer said the Dallas game is “huge” given his team has taken on a vastly different look since suffering a 3-0 road defeat to that squad back in March. Not only that, but the Western Conference leaders are shaping up as a playoff team to beat should the Sounders hope to reach a third straight MLS Cup final. “We’ll know a lot more about ourselves after the game,’’ Schmetzer said. Indeed, the Sounders team taking the field Sunday night looks nothing like the lineup shredded by Dallas five months ago. Beyond Smith, the Sounders should have striker Raul Ruidiaz, midfielders Nicolas Lodeiro and Osvaldo Alonso and center back Kim Kee-hee in the starting XI. 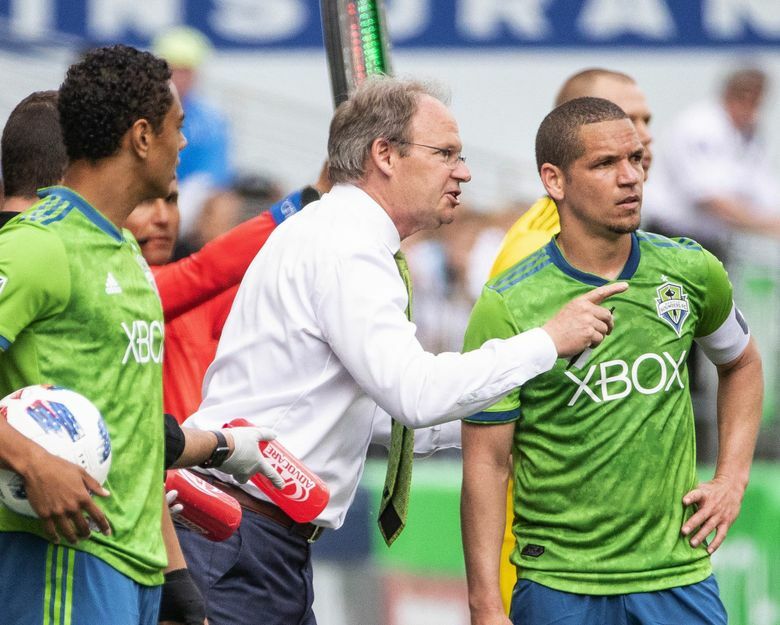 Smith and Ruidiaz weren’t yet with the team in March, Lodeiro and Alonso were hurt while Kim had an ailing calf muscle and played only as a 74thminute substitute before aggravating the injury and missing another five weeks. Of the four attacking players the Sounders started in that game, only Harry Shipp will likely begin this match as well. Victor Rodriguez is still coming off a hamstring injury and while he’ll dress Sunday he won’t see the field until the second half if at all. The Sounders are unbeaten in seven, going 5-0-2 to remain within five points of Real Salt Lake for the sixth and final conference playoff spot. Dallas will be the third team among the top-four overall in Major League Soccer they’ve played the past month. They beat powerhouse New York City FC at home two weeks ago after securing a 1-1 road draw against No. 1 overall Atlanta United FC. Sounders midfielder Gustav Svensson said the recent performances have given the Sounders confidence they lacked early on when facing Dallas with an injury-depleted lineup. The luck surfaced last weekend against Minnesota, when the Sounders – for the first time in franchise history – scored a pair of stoppage time goals to erase a 1-0 deficit and secure the win. But the Sounders, who’d largely outplayed the Loons throughout, helped make their own luck by continuing to press even after they’d tied the match. Dallas represents a step up talent-wise from Minnesota and had gone 4-1-1 its six prior matches before a stunning defeat to cellar-dwelling San Jose last weekend. The overall mediocrity of the conference has been well documented and it’s not difficult to envision another path to the finals opening up for the Sounders if they manage to make the playoffs. Sounders general manager Garth Lagerwey believes he’s supplied his team the horses to make it there yet again, albeit somewhat late after a disastrous first half of the season. Despite failing to secure another attacker – having tried for Peruvian midfielder Paolo Hurtado and several others before the summer transfer window closed — Lagerwey feels the addition of Ruidiaz and Smith resolves two of the team’s biggest scoring issues. Those choices should grow more difficult by the week as Schmetzer figures out who can carry the final dozen games of a stretch run for a team trying to complete a third straight midseason turnaround.